Better tasting and healthier water has never been so convenient with the Pelican premium Shower Filter and Drinking System Deluxe Combo. One of the most important things we can do is protect ourselves from the long-term and damaging effects dangerous chemicals such as chlorine have in our water! The state-of-the art Pelican Countertop Drinking System, with it's unique modern design can alleviate your worries and get your on your way to a cleaner, safer and healthier lifestyle! Start today by enjoying the many health benefits as well as softer hair and skin, with the Pelican Premium Drinking System and Shower Filter! 90-Day Satisfaction Guarantee - Try it, love it or your money back! Transforms your shower into a spa experience! Are you showering in chlorine? So many people in the world today have no idea the damage caused by chlorine, chloramines and other disinfection by-products in their water to their hair and skin. One of the most important things we can do is protect ourselves from the damaging effects caused by these chemicals. Chemicals in your water can cause skin and hair to become dry, itchy and damage your hair - stripping its natural oils leaving it dry, brittle and hard to manage. Not to mention that chemicals in your water can vaporize when your water heats up in the shower, allowing them to be inhaled with every breath. effects of chlorine, choose Pelican!" View Manual Money Back Guarantee Battery Included! Disclaimer: The information on this website has not been reviewed by the FDA. Products offered for sale herein are not intended to treat, cure or prevent any disease or health condition. No medical claims are being made or implied. Real customer review from verified purchase - Non-compensated feedback. I've been using the Pelican Shower Filter for about a week now, and I can clearly see, feel and smell the difference. My skin and hair is softer, feels much less dry. Great pressure from the shower head when I use very gentle running water for the shower!!! I was so surprised! Also, you can easily switch it between 2 and 2.5 gallons per minute, so you have even more control over how much water you use! I installed it easily. Happy as can be, as the water in my apartment comes from a lake near a nuclear power center, and this filter actually makes a difference. I've tried others but none were this noticeable of a difference. Purchased Jan. 2011. The water in our town is hyperchlorinated. This system produces the most wonderful water for drinking, bathing and household use. Our friends are surprised when they drink it. Reordering supplies is simple and delivery is fast. The simple instructions make the system easy to maintain. Water texture is awesome using Pelican Softeners for Well Water... Recommend you use flex piping vs PVC... You can save up to an hour installing the system especially in tight spaces. I love my Pelican Combo Series! In the five years that I've had my water system , I have never tasted or smelled chlorine in my water. My skin is soft and never dry or itchy. I would recommend this water system to anyone wanting to improve their water! We have very poor quality of water in our part of Ohio. After having several National Brand name water firms test the water and give quotes I started studying how to improve our water. PELICAN was and is the answer. The most cost affective,easy to maintain system available. It was very easy to install. If you need to have a plumber do the install it should not be too costly. My neighbors cost fill the water jugs at my house. Our appliances work better, clothes cleaner, bathing is better and the taste is better then bottled H2O... IF YOU WANT THE BEST IT PELICAN ! We needed the works, Sulfur removal system, Sediment filter, Carbon filter, and Salt-Free softener; we purchased the UV Disinfectant sytem too. We have great clean fresh water at our house and the barn. We are quite happy with the system and we are sure our water is safe to drink. I have called Pelican a couple of times and always get a representative who has knowledge about products, services, and processes. Always a great experience. Also, the product is the best out there! My extended family has the PC 600 and PC 1000 and I just referred a friend who purchased one a couple of weeks ago. Keep up the great work! Love,Love this whole house water system.Clean water everywhere shower,drinking,cooking.We are in an area that is rebuilding from the Super Storm Sandy already change the filter 2x in a short time it was so dirty both times due to storm and rebuilding in the area this filter system is a must have,I feel sorry for the people in my area drinking dirty water and they don't even know it.This company has amazing service. I would highly recommend them!!! I purchased the carbon filter and water softener combo for my new home in May of 2015. It's been a great investment. The water is clean and softer and I've had no loss of water pressure at all. I started shopping these systems back in late 2014 and had numerous discussions with Matt who kept in touch and didn't pressure me at all. Once I closed on my house, I bought it and had a local plumber install it. I am very pleased with it and would recommend this product to anyone! Thank you very much Matt!!! I purchased the Pelican Shower Filter on line and in a few short days I received it. The installation was very simple and took about 5 minutes or less to install. Both my wife and I noticed a difference after the first shower. My wife commented that her hair was softer and I noticed that my skin felt and looked better. I was in the process of replacing my carbon media on a Sunday. And I noticed that the paper instructions that were included did not correspond with the verbiage and the figure #5. So I called customer service on Sunday and they were available. The agent that I talked to was extremely nice, professional and very helpful. So far, so good... A suggestion would be to have a You tube video available on their website for future instructions. Pelican has a great staff working their online chat. Jeff K. assisted me in making the right filter purchase for my NS3. reduction of chlorine, chloramine, lead, cysts, mercury and VOCs. Pelican Shower Filter Benefits Removes chlorine, a bleaching and drying agent. Eliminates unpleasant odors from your water. Negative ions and hyper-hydration and the body in fighting common skin conditions. Rejuvenates and moisturizes your skin. Softens hair and adds luster without chemicals. Keeps dyed hair color for longer. Reduces skin dryness, flakiness and rashes. Transforms your shower into a spa experience! Width of Shower Filter Body: 3 7/8"
Countertop Drinking System - Pelican 1-Year Warranty against manufacturer's defects. Pelican Water ("Pelican") warrants to the end user ("customer") that the PDF-450W & PDF-450BN drinking filter system(s) will be free from defects in material and workmanship under normal use and service for a period of 1 year from date of delivery. No warranty is made with respect to defects or damaged due to neglect, misuse, alterations, accident, misapplication, physical damage, installation on water quality outside guidelines for system or damaged caused by fire, acts of God, or freezing. Shower Filter - Pelican 1-Year Warranty against manufacturer's defects. Pelican Water ("Pelican") warrants to the end user ("customer") that the PSF-1 shower filter system will be free from defects in material and workmanship under normal use and service for a period of 1 year from date of delivery. No warranty is made with respect to defects or damaged due to neglect, misuse, alterations, accident, misapplication, physical damage, installation on water quality outside guidelines for system or damaged caused by fire, acts of God, or freezing. This warranty does not cover replacement filter cartridges. Q. Can this be used with an ice maker or fridge? Due to the dual filter design and the requirement of an open relief faucet this system cannot be connected to a fridge or ice maker. Q. Will this system filter out fluoride? While carbon block is known to help reduce fluoride, this system is not tested for its removal. We recommend looking at a Reverse Osmosis system for fluoride removal. Q. Can this be installed under the counter? Yes you can purchase this system in an under-counter model or if you already have our countertop model you can purchase an under-counter conversion kit. Q. How often should I change the filters? The Pelican premium drinking system comes with a built in LED indicator that will remind you when to change your filters. For peak performance we recommend you change your filters no later than 6 months after installation or after 450 gallons of usage, which ever comes first. 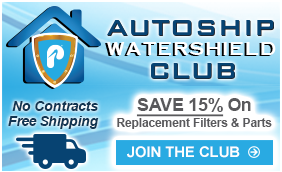 Never worry about when to change your filters again by signing up for our Water Shield Auto Ship program. Q. Does this system require electricity? No. The Pelican premium drinking system requires no electricity to filter your water and does not waste any water. It simply uses the incoming water pressure from your water supply to filter your water through a dual-filter carbon block technology. Q. Will the Pelican shower filter system fit my existing shower pipe? The standard shower pipe connection size in most homes is 1/2 inch, which means the Pelican shower filter system will fit most homes. Q. How much space do I need above my shower pipe to fit the Pelican shower filter system? The Pelican shower filter system needs minimum height above the shower pipe of 6 1/4 inches. Q. Will the Pelican shower filter system reduce my water pressure? No, the Pelican shower filter system is design to eliminate pressure drop to ensure maximum pressure. Q. Does the Pelican shower filter system change my existing shower head height? No, Pelican's patented filter up-design allows for your existing shower head height to remain the same. Q. Can I use my own shower head or hand-held wand with your Pelican shower filter system? Yes you can use your own shower head as long as the connection is a standard 1/2 inch. We do however recommend that you use the provided Pelican dual-flow shower head since it was designed to optimize the benefits and lifespan of your Pelican Shower Filter. Other shower heads might flow at a higher rate than 2.5 gallons per minute, reducing the life of the filter as well as slightly diminishing some of the filter's positive effects. Please keep in mind that shower heads with cut-off valves may damage the filter and void your warranty. Q. How many showers can I take before I need to change the filter? The average person takes one 10-minute shower per day. The recommended filter change is every 15,000 gallons. - The water saving 2.0 gpm setting you will get 750 10-minute showers or 500 15-minute showers. Q. Does the Pelican shower filter system require a plumber to install? Q. How long do the aromatherapy Scent Bars last? Each individual Scent Bar lasts 45-60 days. Q. Is the Pelican shower filter system designed for a constant pressure application? No, leaving the Pelican shower filter system under constant pressure when not in use may result in damage caused to the unit. The Pelican shower filter system is designed to have water flowing through it when in use. Q. Can I use a shower caddy along with the Pelican shower filter system? Yes, with Pelican's patented filter up-design will allow you to use your existing shower caddy. Q. Does Pelican offer an auto-ship program for replacement filters? Yes, Pelican offers the Water Shield auto-ship program which automatically ships your new replacement filters at a specified time to ensure you are never without filtered water. Read more about the many benefits offered to our Water Shield members. Our friendly water treatment specialists are here to help! © 2015 - Copyright PelicanWater.com, An Enviro Water Solutions, Inc. Company - All Rights Reserved.